Stop! 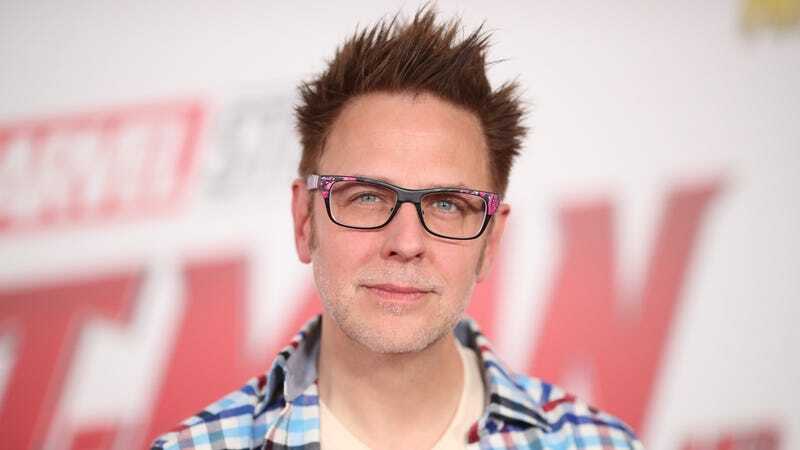 Rumor time: If you’ve been paying attention to the ongoing uproar over director James Gunn being fired from Guardians Of The Galaxy Vol. 3 thanks to a right-wing hit job over a series of old, offensive tweets, then you know it looked unlikely he’d get his job back. Well, today comes the odd news that...maybe he could? Let’s keep this firmly in the realm of “dubious” for the time being, but Deadline reports that Marvel is pressing hard for Disney to rehire the controversial but immensely successful director of its first two Guardians Of The Galaxy films. Supposedly, “back channel conversations are taking place between Marvel Studios and Disney” that could lead to Gunn being brought back to direct his own script. It’s unclear what the path to this outcome would be, since it would apparently involve some sort of compromise to allow the company to rehire him without it looking like Disney is capitulating to things like pressure from the all-star cast, or common sense. It’s not clear if part of the possibility for Marvel convincing Disney to bring Gunn back is thanks to just how widespread forgiveness of the director appears to be, with other studios reportedly counting the minutes until they can lure him away. In a culture where multiple and wide-ranging accusations of sexual harassment can’t keep someone from continuing to run CBS, it does make you look pretty stupid to fire a guy for making appalling and intentionally tasteless jokes back when his job description involved making appalling and intentionally tasteless jokes, especially when he has openly spent years apologizing for and demonstrating a commitment to being better than that. Not to mention the people who orchestrated this hit job, on the other hand, are continuing to proudly espouse no desire to do anything but get worse. Again, this is all pretty unlikely, but the fact there’s even a chance speaks well for some logic about why a person should or shouldn’t be fired from directing a superhero movie. After all, it’s not like Gunn did anything so bad as having a vision for a Marvel blockbuster that was slightly different from the normal Marvel template.